We know that all combined sites are different and each needs to be looked at with important consideration. Shively Labs has standard models, but can also custom-build your combiner to fit your power levels. We can mix and match our bandpass filters to build your system. Our branched combiners are designed to combine the signals of two, three, or four stations over a single antenna. These combiners provide superior performance in the smallest space possible and are fully IBOC-compliant. All Shively Labs combiners use bandpass filtering, providing higher spectral purity, flat in-band frequency response, and typical isolation values of 50 dB or higher – even for frequencies 0.8 MHz apart – and ensuring conformance to the most stringent regulatory specifications. Each branched combiner consists of bandpass filters (one for each station)and a matching section. An optional single directional coupler for the output is available upon request. Branched combiners are designed as systems and must be operated with all bandpass filters in place. 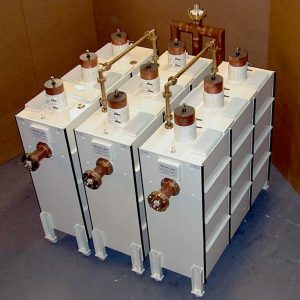 If a combiner is operated without a transmitter attached, the input of the unpowered bandpass filter should be terminated with a small dummy load. Please contact the factory for help in sizing this load. Branched combiners can be expanded by adding a balanced combiner module for each new station, between the branched combiner and the antenna. The output of the branched combiner is plumbed into the wideband port of the last balanced module in the chain. Please note that this will eliminate the use of the wideband port as a second antenna feed.